It’s spring and a luscious one at that. My garden is benefitting from just the right amount of rainfall and at the right times–the rain is lending its bounty to a glorious spring show for urban gardens in Austin and I’m enjoying the results of that rainfall. 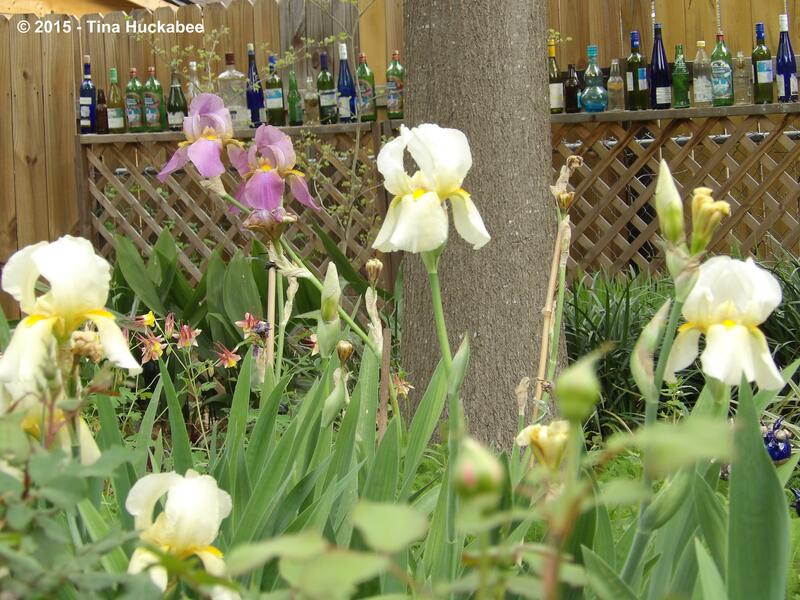 Most spring-flowering perennials and bulbs are at their peak of beauty, including the many iris varieties growing in Austin gardens. …is always the first to bloom and multiplies most readily. 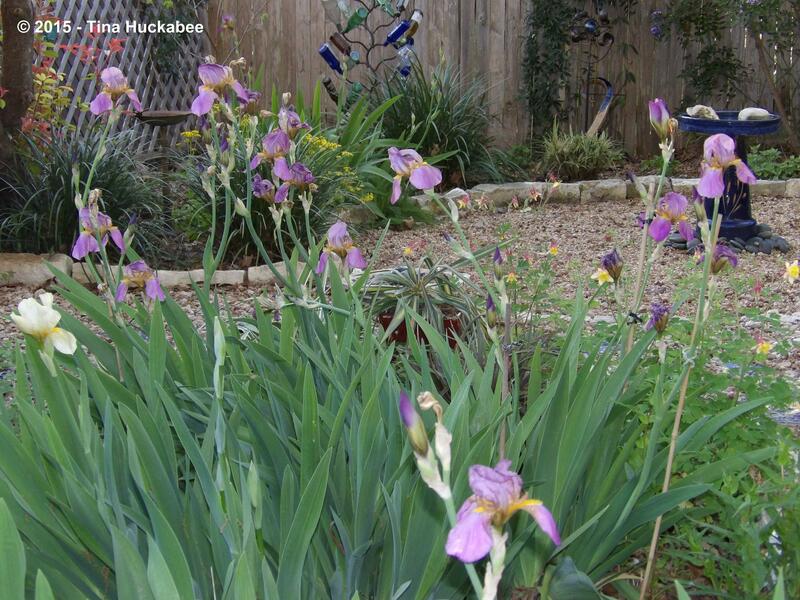 It’s a common iris in Austin–I see it everywhere. And why not? It’s tough and hardy and who doesn’t want something like that gracing their garden space? 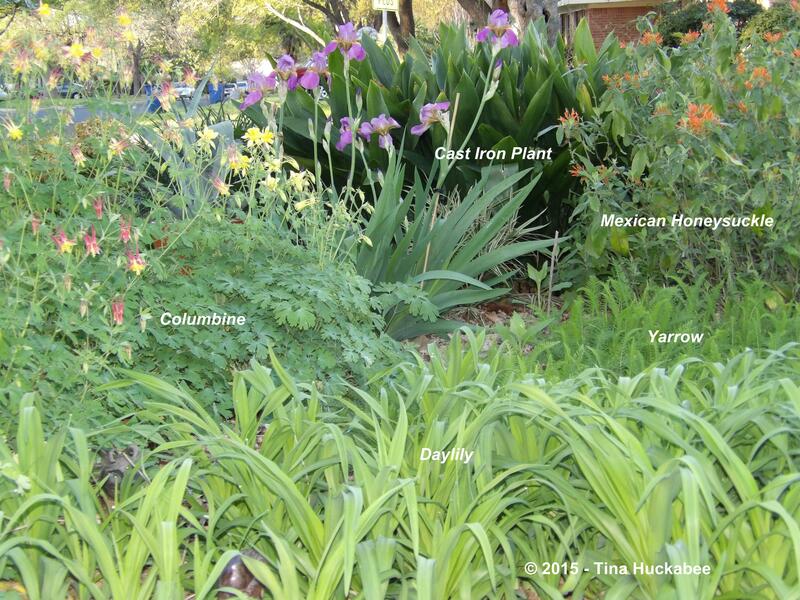 Here it is dancing with other spring bloomers like Columbines, Aquilegia and Mexican Honeysuckle, Justicia spicigera. Also in the photo are the not-yet-in-bloom orange daylily and Yarrow, Achillea, with a backdrop of Cast Iron Plant, Aspidistra elatior. 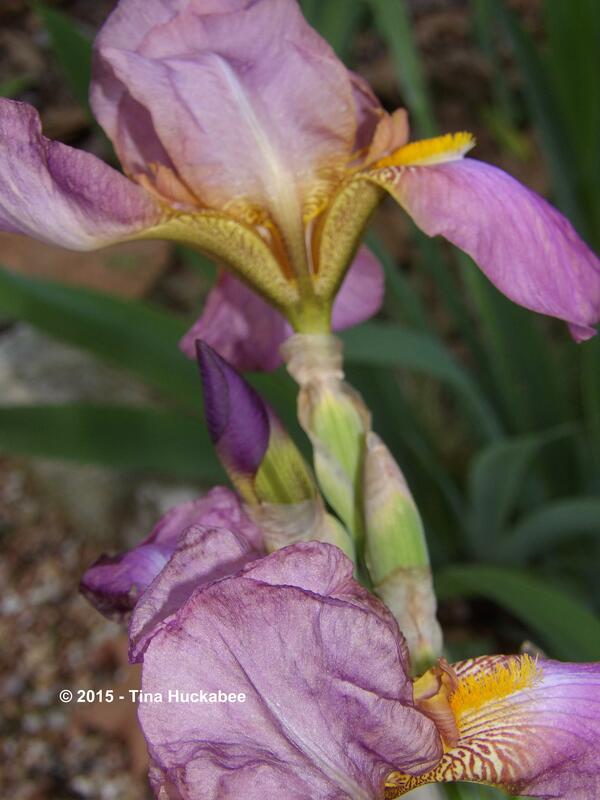 I don’t know the name of this iris or the other iris varieties in my gardens. 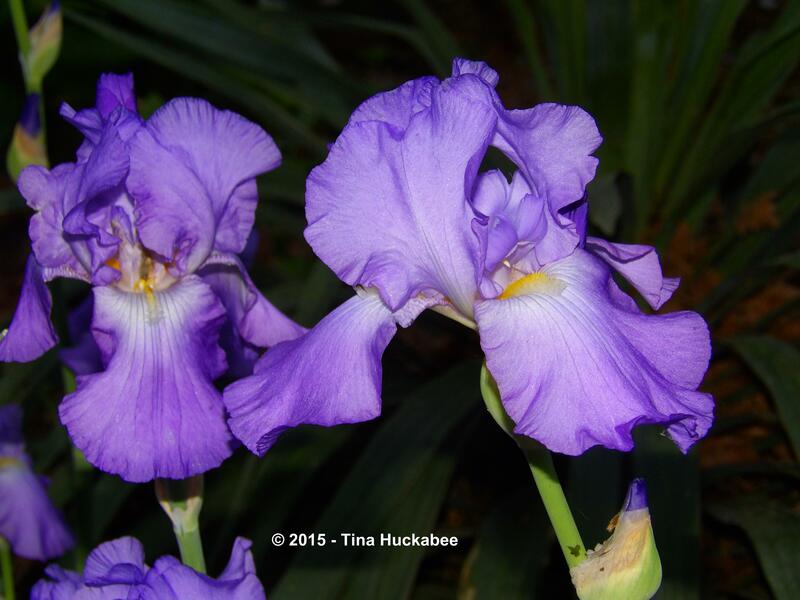 I have researched information in an attempt to learn the iris names, leafing through books and scrolling online, but there are so many iris varieties and just similar looking enough to one another, that I gave up exact identifications. 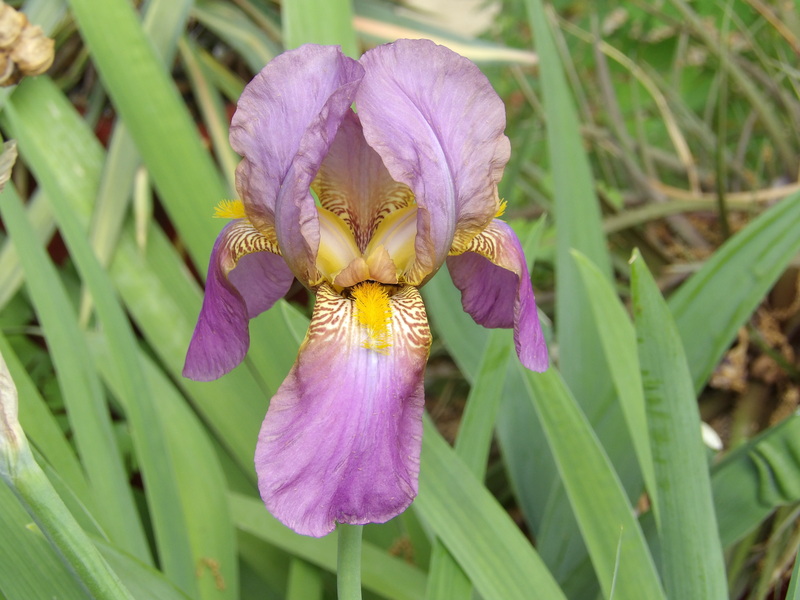 While I like to know the names of the plants in my gardens, I’m not an expert at iris identification–that’s a study unto itself and not a body of knowledge I can lay claim to. 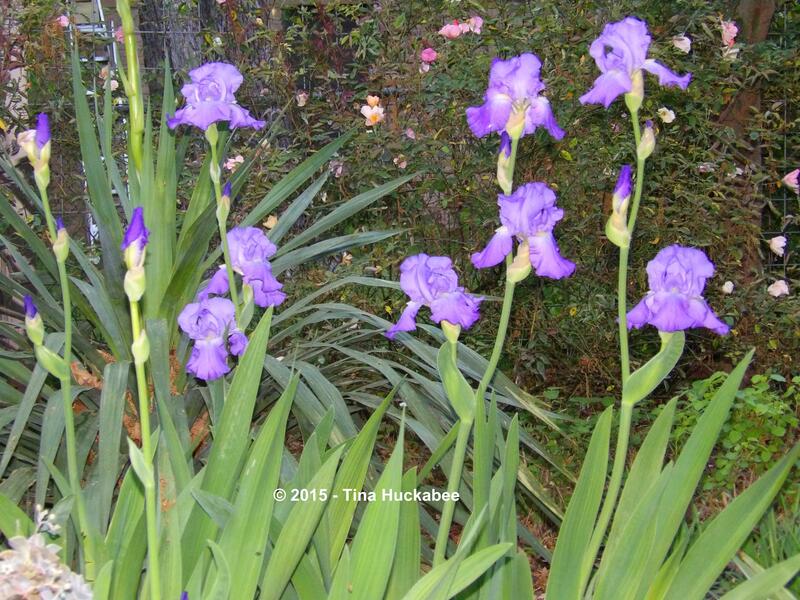 I content myself with simply enjoying these garden gifts: I anticipate and revel in stunning iris flowers each spring, appreciate their hardiness during our hot summers, and value their evergreen habit in winter. 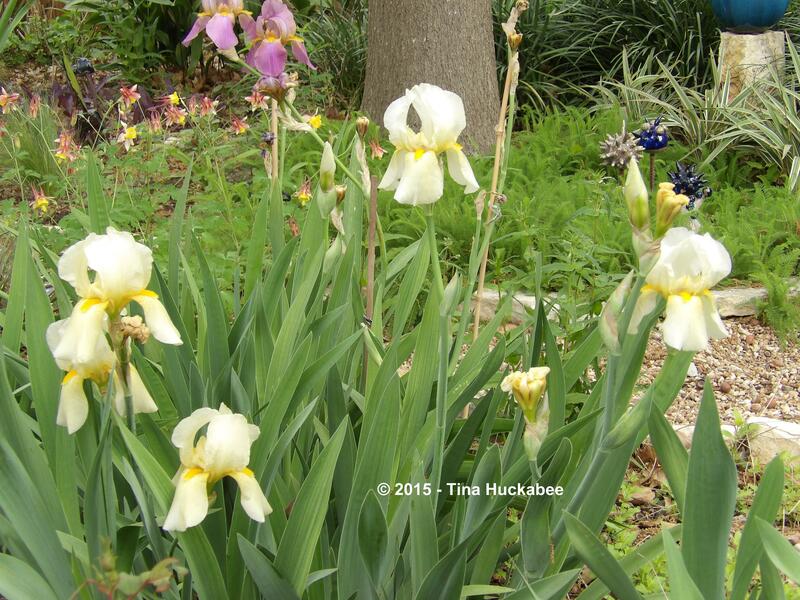 This lovely creamy yellow iris was given to me by a long-time volunteer, an iris aficionado, at Zilker Botanical Gardens when I was employed there a few years back. I dutifully wrote the name down, then promptly misplaced that piece of paper. 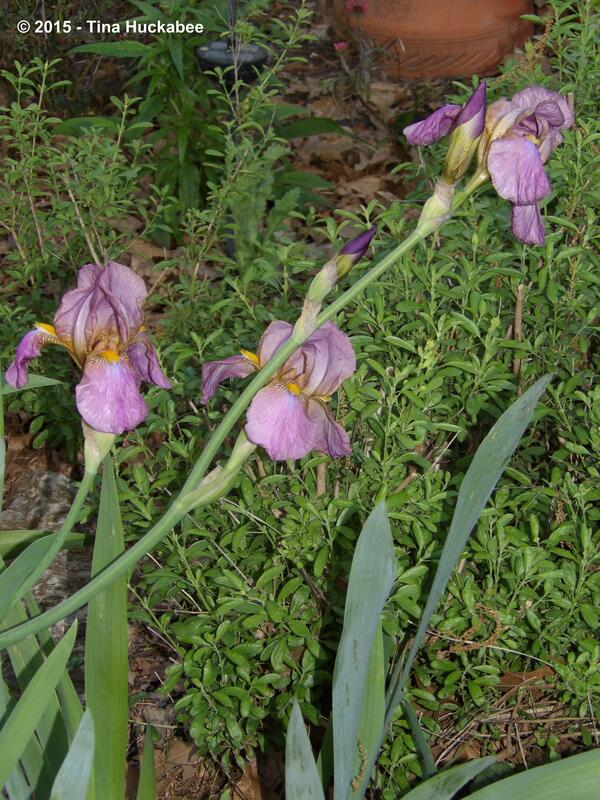 With disorganization of method and haste in planting, I flubbed a chance to actually know the name of an iris. 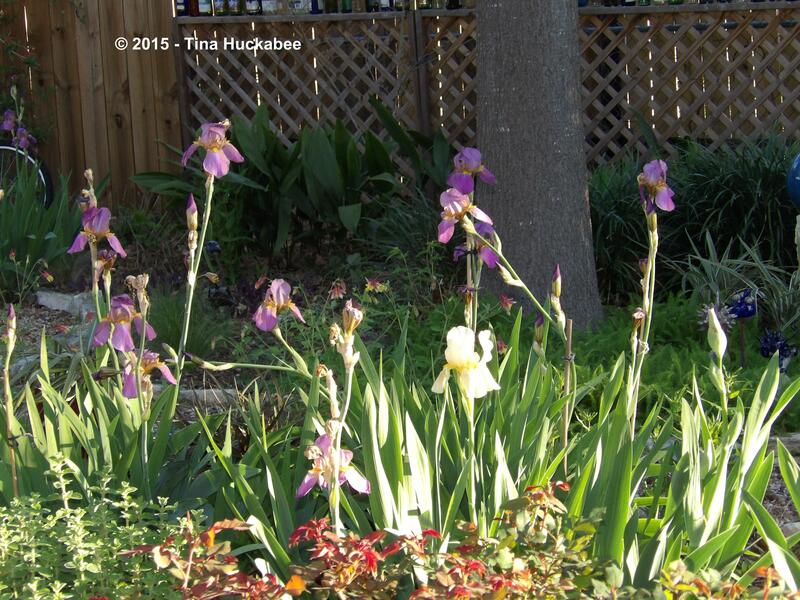 Nevertheless, it’s a wonderful addition to my early spring garden because all three of my original irises are purples and lavender, so I like having something different to pop the iris palette. 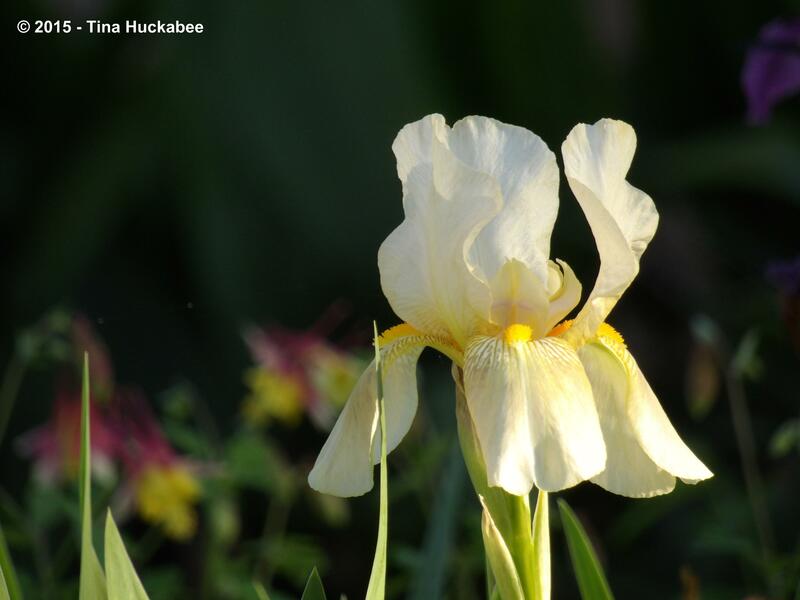 This yellow beauty is a show stopper of an iris. 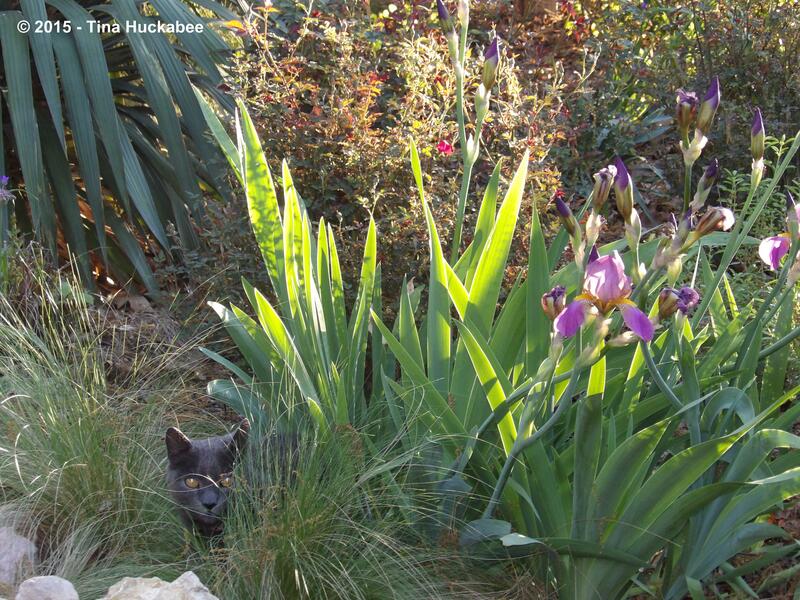 Shoshana’s Iris is also in rich flowering-mode this spring. That’s not an formal name, but instead, penned by Pam of Digging, after I passed along some bulbs to her when she lived in the neighborhood long ago. 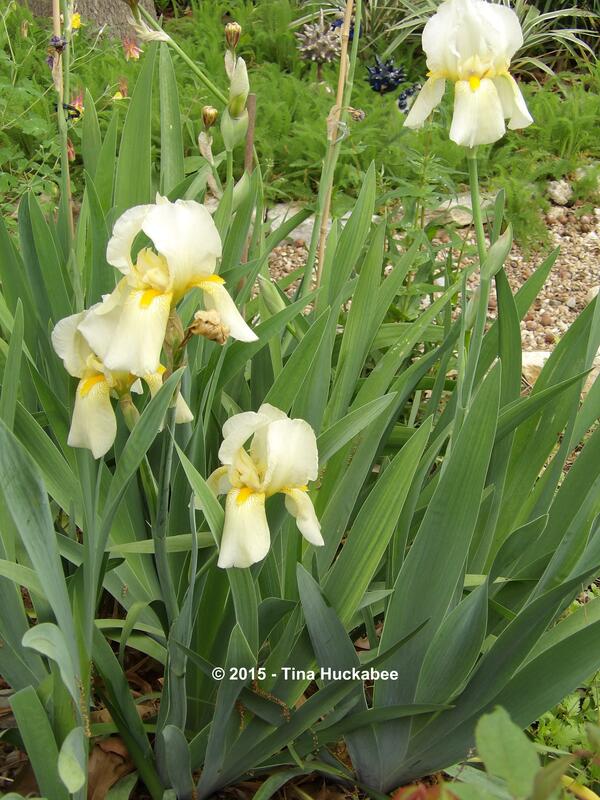 Pam calls it ‘Shoshana’s Iris’ after my daughter, Shoshana, who died suddenly in 2006. It is a touching homage to a beautiful girl. 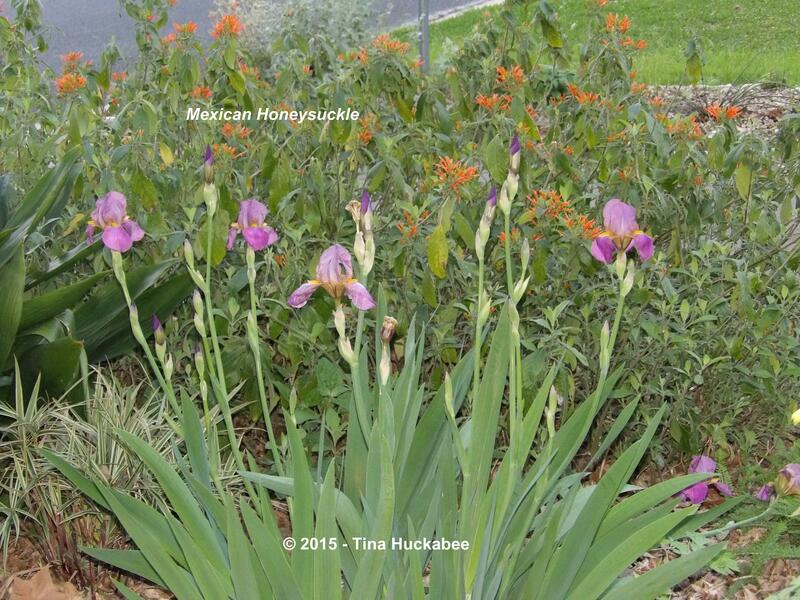 On a recent walk, I noticed that a long-time resident of the neighborhood, one street from me, currently has the same iris blooming and I’ve never seen it in her garden before. Did she gift the iris to the former owners of my house? Or, was it the other way around? Does she know the name of the iris? I plan to ask her. In the end I’m not sure it matters whether I know the exact name or not, or where this iris came from. I love the color, form, and fragrance of this sometimes persnickety bloomer and am glad to grow it in my gardens and to share it when I separate the bulbs. 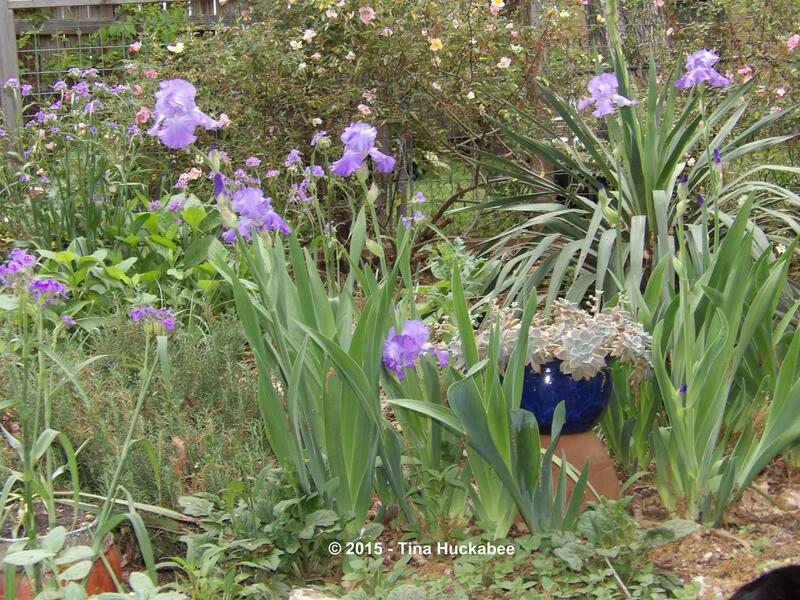 More iris blossoms will open in the next few weeks and I’ll treasure each during their fleeting appearance in my Texas garden. 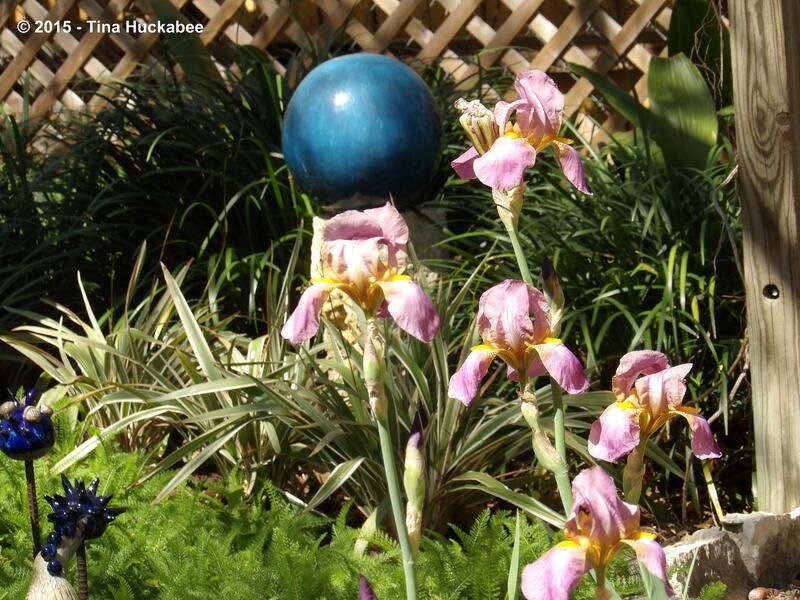 This entry was posted in Central Texas Spring Garden, Iris Blooms, Spring Garden and tagged 'Shoshana's Iris' by Tina. Bookmark the permalink. At times I think knowing “everything” about a flower does nothing to enhance my enjoyment of it. The way the blooms you’ve shown dance through your garden scapes, I cannot see how reading (and as far as my mind goes) promptly forgetting the cultivar names could help me appreciate their delicate colors or gently elevated display. With one notable exception. Shoshana’s Iris. That name is so very special, a tribute. 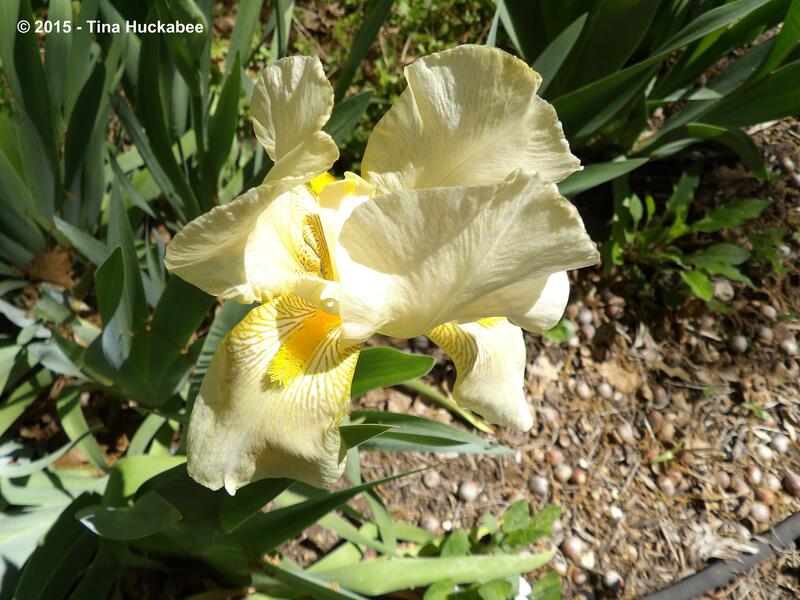 May those iris in your spaces and the inspiration for their special naming never fade from memory! I like to learn the names of plants, but have given over to simply enjoying some of them, with little knowledge about them, except that they’re beautiful. As for Shoshana’s , any opportunity to say her name and remember, is a gift. Your irises are lovely! The names are not important since the flowers don’t even know their own names. So fitting that Pam has named the iris you shared for your daughter. Happy Spring! Happy springtime to you, too! What a beautiful name: Shoshana. I have to agree with everyone else that naming the iris after your daughter is a really special tribute. And what a gorgeous iris it is. Garden plants can come and go in popularty but there really is something special about these traditional favourites found in older gardens. I have irises and crinums growing here and they are as tough as can be. They’ve survived droughts and a series of uncaring renters. I love the idea that some mystery gardener planted them and may be gone but he has left something of himself behind. Today I was walking along Ladybird Lake and struck up a conversation with an old timer. He asked me if I knew who Ladybird was and if I had ever met her. Apparently he had. We both agreed that she left a pretty special legacy behind. Flowers are both ephemeral and forever. Shoshana is a beautiful name–it means “lily”. 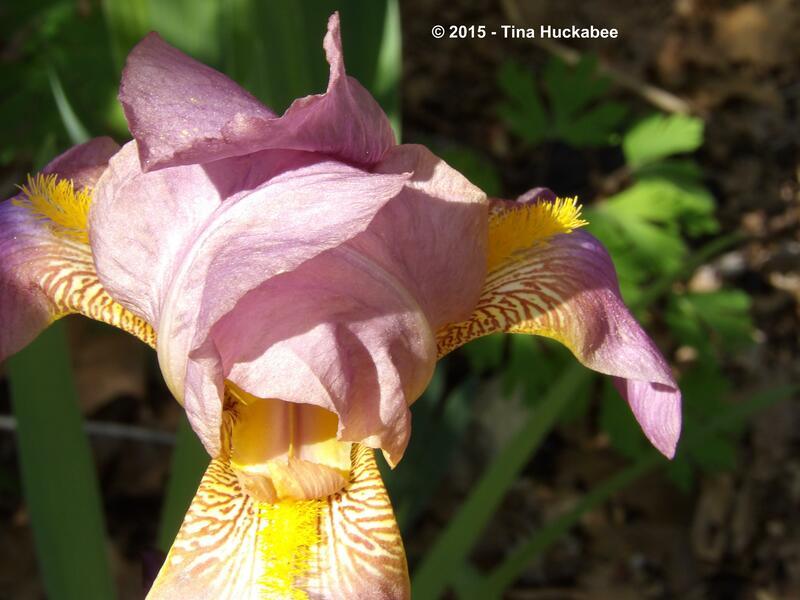 Like my girl, the iris is beautiful–it’s a really vibrant lilac and has those darling ruffles. I just love the ruffles. 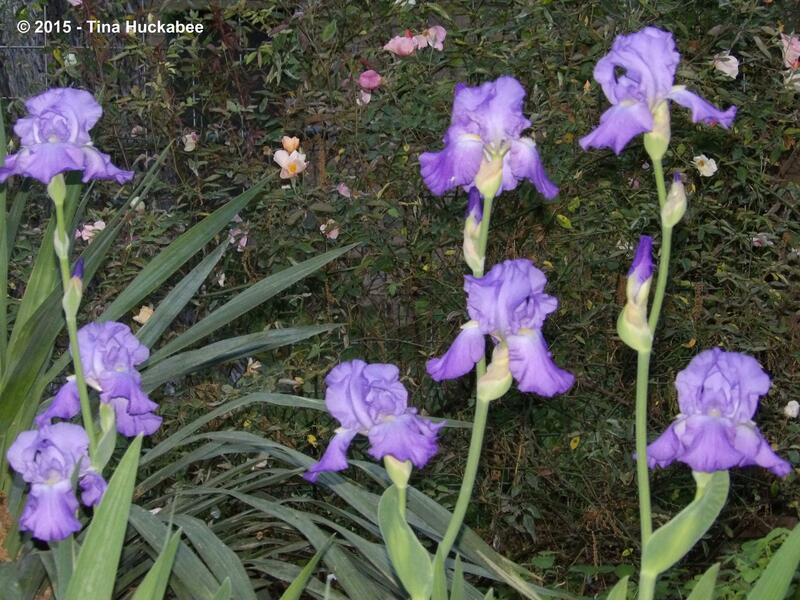 Today I found another garden of an elderly lady where the same irises are in bloom, but no one knows the true name. 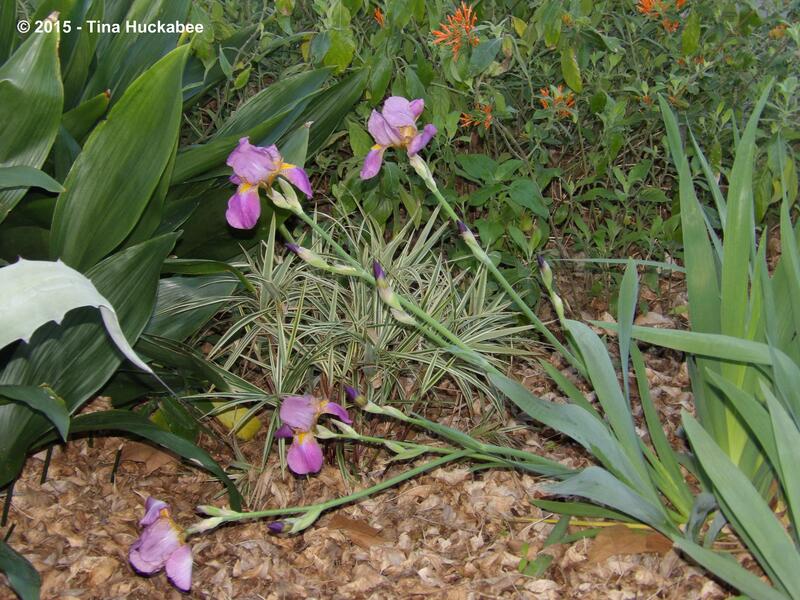 There’s nothing like those hardy plants that are ignored, but thrive for decades in gardens–the antique roses, the hardy iris and daylily species–and of course, our beloved native plants. Ladybird was onto something…. I love iris and can’t wait for all mine to bloom….I barely know any names of mine but love them all….I especially love that yellow columbine at the end….I have seen that growing in the SW and understand it is native to the SW.
Yours should bloom soon, though, so you have something glorious to look forward to! 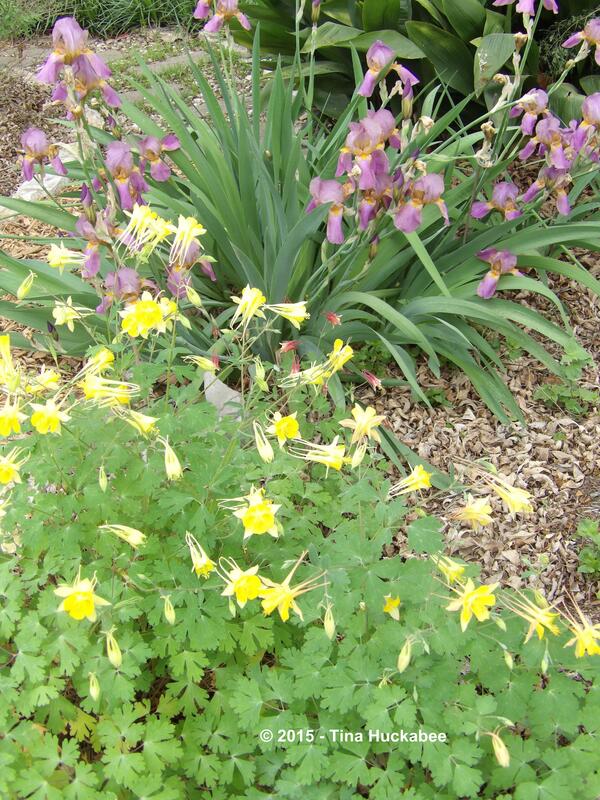 Yes, you’re correct: the yellow columbine, Aquilegia chrysantha (var. hinckleyana) is native to Texas, as is the A. canadensis. Irises are magical. I need more! 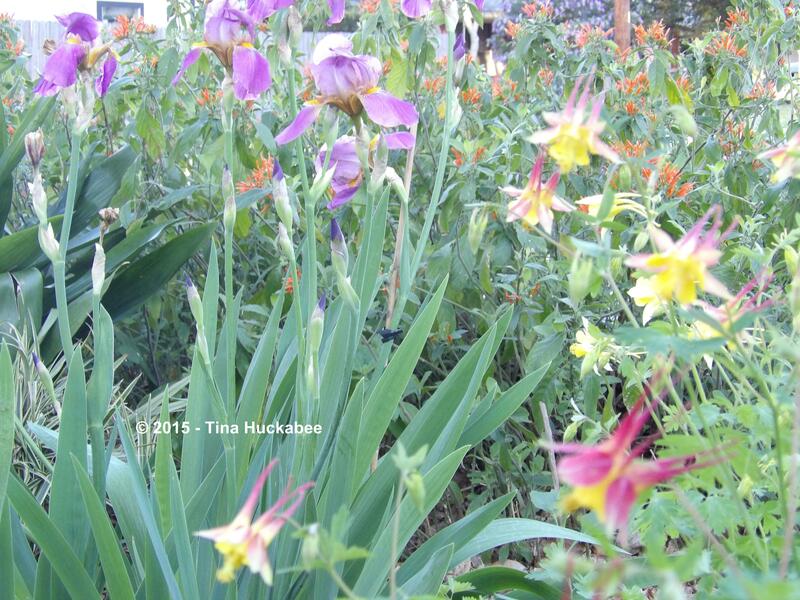 All I have are bearded irises, and they don’t bloom until late May. Looking forward to it! I hope you have as gorgeous an iris show as we’ve had. Enjoy!